I'm still leaning towards a launch some time next Spring.While I do believe that an iPad Mini is probably coming , I don't foresee it coming this fall. The thing is, it's a near certainty that the new iPhone is shipping this fall. Have you nosedived how many parts, photos, and docs have leaked? Bunches. Remember the few months right before the iPad 3 launched, and how many times parts for that device leaked? Bunches. If the iPad Mini were going to launch this fall, don't you think we'd have seen more leaks? 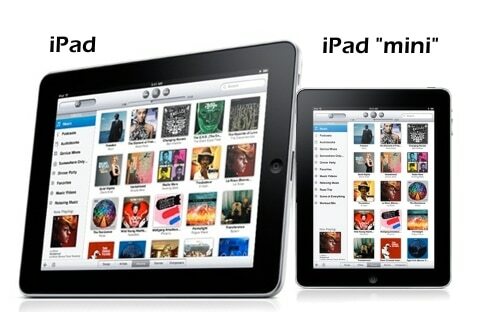 How many iPad Mini leaks have you seen? I know of 1 set of photos showing an engineering prop and one diagram, neither of which is conclusive proof. I might be the only one, but I can recall the time before the launch of the iPad 2, when the many discredited props kept showing up (as well as some real ones). All those fake iPad 2 came from the wishful thinking of Chinese case makers, and there's a good chance that the current iPad Mini leaks share that genesis. Show me the screen assembly, or the cables, or the mainboard. Then I'll believe the iPad Mini is coming soon. But until then I will continue to disbelieve the launch rumors. Edit: Mike Cane reminded me that there's also a backside for what could be the iPad Mini, and it leaked in early June. I still want to see more leaked parts. But I do think it's coming; the 7" Android tablets are doing quite well, and that puts Apple in a position to release the iPad Mini and get credit for inventing the idea. Heckling of fanbois not withstanding, the main reason i beleive in the iPad Mini is that 7" tablets have a different set of use cases than 10" tablets, and that outs them in slightly different market niches. Apple has a good chance of selling the iPad Mini to people who already own an iPad as well as people who passed because the iPad was too big for what they wanted to do. >>>How many iPad Mini leaks have you seen? I know of 1 set of photos showing an engineering prop and one diagram, neither of which is conclusive proof. Although now that I look at that again, it is suspiciously similar in proportions to that Gotta Be Mobile “leak”… Hm. My comment is based on the fact that discounts for Apple products always seem to precede a new product release. Target’s Sunday advertisement has the new iPad listed with a $25 gift card. Based on that I am beginning to think there really may be a new iPad of some type before Christmas.